A video of the incident shows a huge circle in the sky, and is currently being shared widely online. 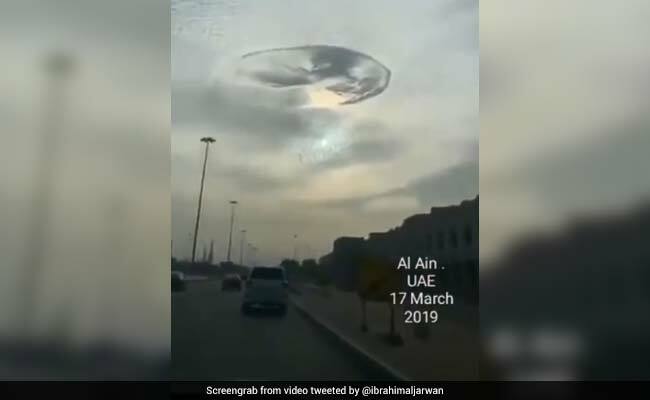 A video shows the "hole in the sky" over the city of Al Ain in UAE. Citizens of UAE were left puzzled after a mysterious hole appeared in the sky over the city of Al Ain this Sunday. A video of the incident shows a huge circle in the sky, and is currently being shared widely online. It was posted by on Twitter by Ibrahim Al Jarwan, who, according to the Daily Mail, is a meteorologist and astronomer. The hole was described by Twitter users, among other things, as a "whirlpool hole" and a "portal to another world". Sharing the video, he wrote: "This rare and beautiful phenomenon was seen this morning in Al Ain City." The video left many wondering whether the hole was a UFO, a portal to another world or a glitch in the matrix. Seems to be a round UFO in the clouds. Making its present felt. UFO resting in the clouds. Omg they are coming ???????????????????? However, as Daily Mail reports, the mystery of the hole in the sky was quickly cleared up by meteorologists. They explained that the phenomenon, known as a fallstreak hole, occurs when the water temperature in the clouds is below freezing, but the water, in a supercooled state, has not frozen yet due to the lack of ice nucleation. Fallstreak formations are super rare and can expand up to 50km, which is why they are often mistaken for UFOs.